The Department of Aerospace Engineering Demeter Team won second place in the 2013 RASC-AL Exploration Robo-Ops Competition (Robo-Ops) held June 4–6 in Houston, Texas. Robo-Ops is an engineering competition sponsored by NASA and organized by the National Institute of Aerospace. Undergraduate and graduate students create multi-disciplinary teams to build a planetary rover prototype robot and demonstrate its abilities to perform a series of complex tasks. 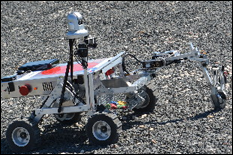 Robo-Ops took place at NASA Johnson Space Center's Rock Yard, where robots navigated a planetary surface simulation that included rock fields, lunar craters, sand dunes, and a Mars hill. While participating teams were allowed a three-person support crew onsite at the competition, the robots had to be controlled remotely from a home campus "Mission Control Center" using a commercial broadband wireless uplink. One of eight teams selected to participate, the Maryland team included 17 students from the Department of Aerospace's ENAE 488R class, Planetary Rover Development, and their faculty advisor Dr. David Akin. This year's robot, Demeter, a descendent of last year's RHEA (Remote Harvester Earth Analogue), was named after the Greek goddess of harvest since the competition task is to collect, or "harvest," rock samples. On the ground in Houston was Demeter's "Away Team"; students Kevin Davis (team lead), Chris Flood, and Mike Schaffer. They provided onsite support in the event Demeter experienced a malfunction or needed repairs. The "Mission Control Center" back in Maryland was helmed by students Doug Klein, Doug Astler, Kyle Cloutier, Calvin Nwachuku, Josh Bernstein, Samantha Johnson, and Sidd Paruchuru. Operating from the Neutral Buoyancy Research Facility, Mission Control remotely guided Demeter during the competition, navigating the robot over obstacles up to 10 centimeters in height, up and down slopes, and collecting as many rock "samples" as possible during the one hour trial. "Demeter worked like a champ driving around the four sections of the planetary surface simulation," said Dr. Akin. "It was definitely a strong effort by the students." After Maryland placed second behind University of Massachusetts-Lowell's Rover Hawks, and ahead of Worcester Polytechnic Institute's ORYX, Dr. Akin said, "We"re already planning for next year!" For more information about the Demeter Team, check them out on Facebook or visit their website. For complete details on Demeter, the robot, view the team's poster.